Better (awfully) late than never: YouTube is adding livestreaming support to its mobile apps so content creators can broadcast video straight from their phones. It’s odd that the world’s biggest video platform took so long to introduce this feature, after the concept was pioneered by Meerkat last year and then taken up by Twitter’s Periscope and Facebook Live. Of course, it’s not really a battle between the three, as they help users cater to vastly different audiences. You probably follow more entertainers on YouTube than the other two services, which are home to your close friends as well as public figures. From the screenshots, it looks like the user experience on YouTube’s app will be similar to Periscope, with incoming chat messages from viewers and the ability to limit viewing to a private group if necessary. YouTube notes that as with other video content on its platform, you’ll be able to search for livestreams, find them through recommendations and playlists and protect them from unauthorized uses. In April, it launched 360-degree livestreaming video support, but the feature only works with 360-degree cameras at present. Mobile livestreaming will roll out soon to all users. 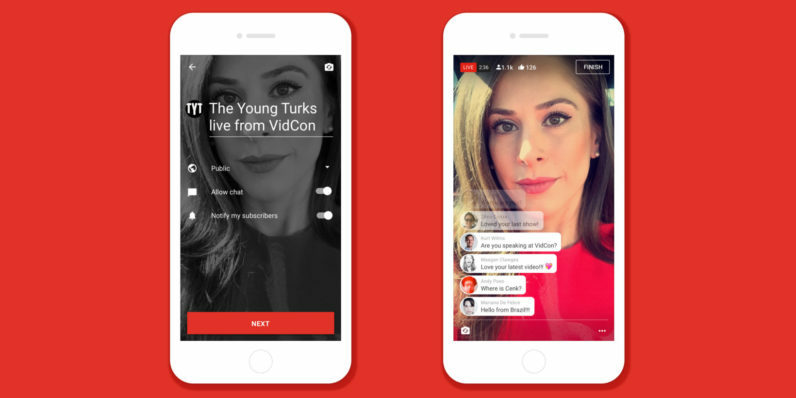 For now, it’s available to creators like The Young Turks and AIB, who are playing with the new feature at VidCon in Anaheim, California.